The Art of Shaving Fusion Chrome Shaving Brush has been expertly hand-crafted from polished chrome and fitted with badger hairs for unrivalled results. Prepping skin for a comfortable, close shave, the badger hair bristles create a rich lather on skin, softening and lifting beard hairs while gently exfoliating to leave skin feeling soft and smooth post-shave. 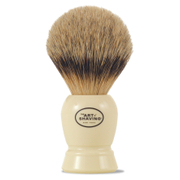 Designed with comfort and practicality in mind, the shaving brush has a micro-textured handle for excellent grip. Wet Shaving Brush with hot water. Place a small amount of Shaving Cream on the tip or center of brush. Bring to a lather on face using a circular motion. To generate a fuller and richer lather, simply add more hot water to brush.